A monumental work by Jean-Michel Basquiat, estimated to reap about $30 million at auction, is coming to Sotheby’s in May. The roughly 12-foot-by-12-foot “Flesh and Spirit” is being sold by the estate of Dolores Ormandy Neumann, an early champion of 1980s New York graffiti artists. It will be offered during the contemporary art sale on May 16. The collector bought it for $15,000 in 1983 -- the year it was completed -- from an exhibition at Tony Shafrazi Gallery, according to Sotheby’s. The painting’s title was inspired by Yale University art historian Robert Farris Thompson’s book “Flash of the Spirit: African & Afro-American Art & Philosophy." It consists of several attached canvases and includes diagrams, text and images of disconnected body parts, brain and bones. “It’s raw, and at the same time, it’s elegant,” said Anthony Grant, a New York-based art dealer. “Between the iconography, scale and material, it’s got everything." 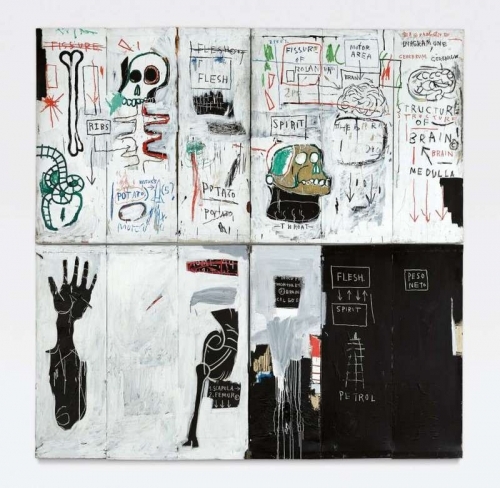 It’s the most expensive work by Basquiat (1960-1988) to go on the block since Japanese billionaire Yusaku Maezawa bought a painting of a skull by the artist at Sotheby’s for $110.5 million in May, the auction record for an American artist.